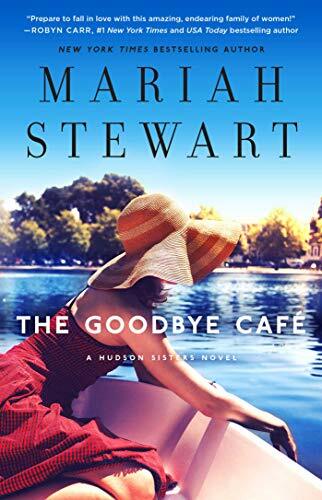 Goodbye Café is the third book in a trilogy of the Hudson women by Mariah Stewart. This was my first book by Mariah Stewart, and while it can be read as a standalone I definitely felt that I was missing some background information on a lot of the secondary characters and even the past history of the main characters as well. I do recommend going back and reading the first two novels prior to starting this one, just for a better reading experience more than a real need. This book follows Allie Hudson Monroe who, like her sisters, has been summoned to small town Pennsylvania due to the stipulations of her father’s will. She is working on renovating the local theatre so that she can collect her inheritance and go back to Los Angeles with her fourteen-year-old daughter. The story starts with Allie painting the ceiling of the theatre on her own, while reading I had assumed that she just wanted to do this – but doing a bit more research I found out that the theater’s renovation fund had run out and so Allie had to use her skills to finish the job. This is just one example of small details that you really would not know unless you have read the previous two books. Again by not reading the previous two books, I missed a lot of what was hinted at in terms of Allie’s personality. Goodbye Café portrays Allie as a mature mother who is slowly but surely getting to know herself and accept herself. Whereas there are many references to Allie being rude and selfish and difficult to get along with. I did not get this reading of her at all, but again I had not read the previous two novels. The focus of the book is mostly on Allie’s relationship with herself and her daughter. It is hinted at that Allie had an abusive relationship with alcohol, but now through her reclaimed art talent and her newly found waitressing talents, she is finding other ways to find fulfillment in her life. There is also a big emphasis on her as a mother and how she protects her daughter’s best interests as she navigates young adulthood. There is also a smaller focus on her budding relationship with the local police chief, Ben. I really enjoyed reading the interactions that Allie and Ben had, although I do wish that the author explored that relationship a bit more. Ben came with a lot of history that was only briefly commented on. While I did enjoy this book, it never made me eager to read it. There was a lot of drawn out explanations and descriptions of things which I did not feel was needed. I would have preferred a bit more romancing in the text and a bit less drawn out conversations about mundane things.